Yes, you can do it! You can give up your beloved french fries and celebrate their exit from your life. Before you start arguing with me about how you simply will never leave them - have you met "homemade sweet potato fries"? Get out of that BAD relationship and move into a healthier and more loving space, and you will NEVER go back. I promise. Baked sweet potato fries have the crunchy outside, and the soft inside and they pack a nutritional wallop with 219% of your daily allowance of Vitamin A in one serving. And that is just ONE of the benefits of eating them. Half a potato is going to set you back 111 calories (with the olive oil), but that is nothing compared to buying and eating fast food fries (560 calories for a large fries). You could eat the entire recipe below and still have calories to spare! Grab your favorite flavors and just toss them in. They become so flavorful and seriously addictive (like those other french fries - but you have forgotten them and moved on because these are SO much better). After you make these, just pop them in your fridge. Eat them as a snack or add them to your salad. Mush them in your yogurt or eat them for breakfast After they are refrigerated, they aren't as crunchy but they still taste really good. What do you put in your sweet potato fries? Preheat oven to 450 F. Half the sweet potatoes lengthwise. Place on flat slide and slice 5-6 spears (thick and long strips) of sweet potato. Place them on the aluminum foil and toss with olive oil and your favorite flavorings. Spread them in one layer. It is important that they have space around them and aren't piled up on each other. Bake for 15 minutes and turn with tongs or a spatula. Bake for another 5 to 10 minutes, until lightly browned. Add optional salt and pepper. Serve hot, room temperature, or cold. I really want to like sweet potatoes, because they are so healthy. But I don't. They are way too sweet. I tried making sweet potato fries using savory ingredients, but I just can't get past that sickeningly sweet taste. Potatoes/fries/vegetables just aren't supposed to be sweet. Who says how something is supposed to taste? They're SWEET potatoes. They're good for you and healthful. The fast food companies have ruined our taste buds and health with greasy junk. Now we think vegetables are nasty. Food is for nourishment snd not necessarily pleasure. We have to overcome our emotional attachments to food, stop using food as a pacifier, eat and live. I love sweet potatoes, but not as fries. When I want french fries (which fortunately is not often! ), I want the savory saltiness. Even putting savory toppings on SP doesn't do it for me - the flavors just don't mesh for me. Whoa, Leslie. IN MY OPINION, they're not supposed to be sweet. I like savory things. Most vegetables are savory, therefor, I like them savory. It has nothing to do with fast food (which I eat about 6 times a year!). If anything, fast food makes us want more sweet things; generally America wants everything sweet. I don't think vegetables are nasty - just sweet potatoes. I for one, am a huge fan of sweet potato fries and order them out whenever they are available. However, I haven't made them myself, and will try this week!! i like to slice the sweet potatoes really thin and barely spritz them with oil to make crispy chips. you have to make sure they don't get black though. Wow, lots of differing opinions on sweet potato fries here! I've heard a lot about them and since they're supposed to be much healthier than regular french fries, I think it's worth a shot. Thanks for the recipe! I'm looking forward to trying this. I honestly think Veggie Sticks taste EXACTLY like french fries! Try it! Sweet potato fries blow regular fries out of the water! I will never eat another regular french fry as long as there are sweet potatoes in the world. That recipe is great Snack Girl, thank you. I LOVE sweet potato fries, i've been ordering them when we go out to eat, thanks for the recipe snack girl, i'm hoping i can get my kids to like them too! Wow, Leslie, that is harsh. We are all entitled to our likes and dislikes. Thanks for the laugh. I can't wait to try the SP "fries" - so glad they are baked! The issue of eating for pleasure or sustenance is a huge one. I think perhaps the divide between those of us who eat to live and those of us who live to eat is similar to the one between dog people and cat people - and just as personal. I love sweet potato fries! Unfortunately, most of the time I get them they are fried (I assume). I should start making them at home more often! 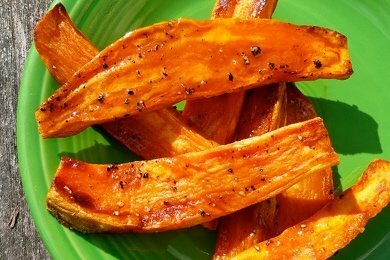 I love sweet potato fries--even baked ones, but there is a key to them that might make Leslie like them. I too think that sweet potatoes are "too sweet"--if I tried to eat, say, a baked sweet potato. In japan, they ROAST sweet potatoes and serve them on the street. So I like to bake my "fries" to take full advantage of the caramelization of sugar taken to the max. I am one of those people who hated marshmallows as a kid until I discovered you could catch them on fire. So I love to BURN the sweet potatoes slightly so there is black, charred, bitterness to it. THAT is yummy to me. I'm with Cristina. Sweet potatoes are too sweet. I can only eat them for dessert, baked with lots of cinnamon and even then only once in a while. I love me some sweet potato fries! Thanks for the reminder to make these. I love 'em. Funny enough our local Burger Street (it's a burger chain - drive thru only) has started serving Sweet potato fries, so i had to try them. They're almost like matchsticks and, of course, fried, but i enjoyed them just the same. A nice deviation from regular fries. I wished they were more like the steak-size fries like the ones in your photo above, which is how i like to make them. One question to everyone: do you peel the skin or leave it on? SG didn't mention peeling them so I'm curious. I've never tried leaving the skin on when i roast my sweet potatoes... but i'm willing to try it if it's recommended! @Angie - I have left the peel on and it works great! Give it a try. Had these as a side dish with dinner last night. Sprinkled with stevia and cinnamon - they were a big hit!